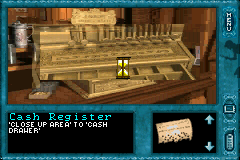 GBA Nancy Drew: Message in a Haunted Mansion (USA) in 08:49.02 by AKheon. You probably know Nancy Drew. She's a popular fictional character who has a knack for solving (and attracting) all sorts of mysteries. Basically a Mary Sue, being rich, handsome, immensely talented and leading an exciting life. As the game begins, she comes to a hotel owned by her friend's friend where accidents have been happening, and rumors even say that it's a ghost behind all the mayhem, perhaps exacting some sort of revenge from beyond the grave. But eventually we find out the problem is a much simpler and common one instead, human greed, and that there's really nothing supernatural going on in the hotel, with the exception of Nancy Drew herself, who knows solutions to puzzles without ever finding them and who causes other strange stuff to happen as well.